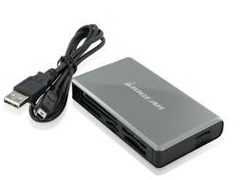 IOGEAR's 56-in-1 Pocket Card Reader/Writer is an ideal solution for hi-speed, bi-directional image and data file transfer between your computer and multimedia devices. Images and data can be downloaded directly from your memory cards without using additional adapters. It works with all major memory card formats and supports high capacity. With direct USB 2.0 high-speed file transfer (up to 480Mbps) from memory cards used in your digital cameras, cell phone, or MP3 devices, you can save time and conserve power on devices.